The show took place at tiny 1,500 capacity Noorderligt venue in Tilburg. Tilburg is located 70 miles to the South of Amsterdam and Hilversum where the 'Hysteria' album had been recorded between 1984 to early 1987. 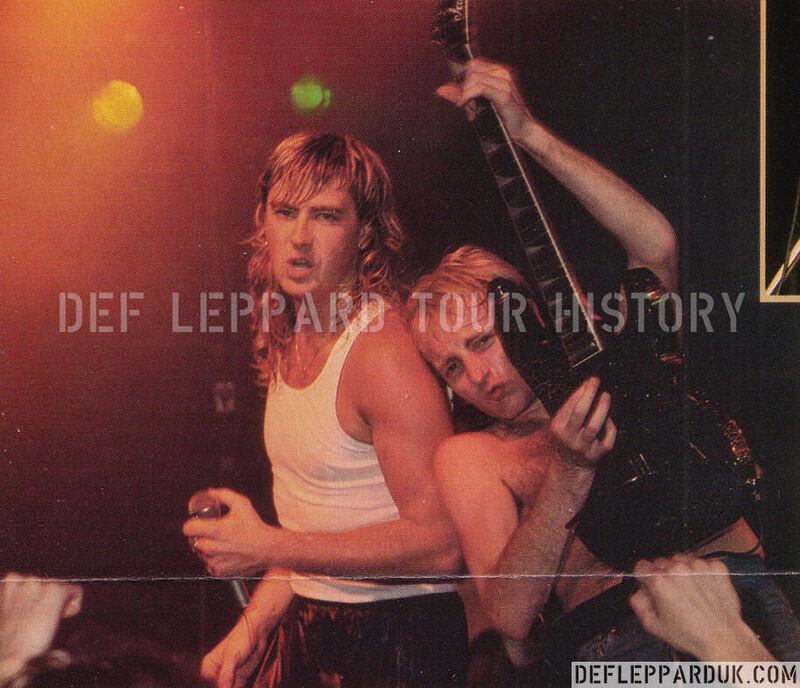 This was the first live appearance of the main 1987 to 1988 Hysteria era. The band having filmed the 'Animal' and 'Women' promo videos outside in Amsterdam in late May. The first of three warm-up shows before the main Hysteria world tour would begin in late August. A second night was played here the following day before an outdoor festival appearance in the Dutch capital city of Den Haag (The Hague). Following a press tour they would return to Amsterdam to rehearse on the UK tour stage ahead of the first world tour show in Dublin. The venue was closed in 1998 and a new apartment complex has been built in its place. 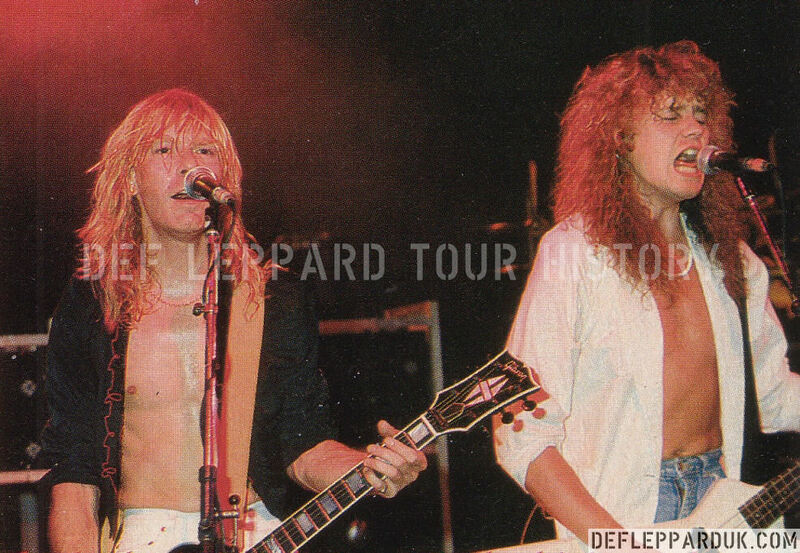 The show featured the first ever playing of five new 'Hysteria' album songs - 'Women', 'Armageddon It', 'Animal', 'Hysteria' and 'Pour Some Sugar On Me' were all debuted. 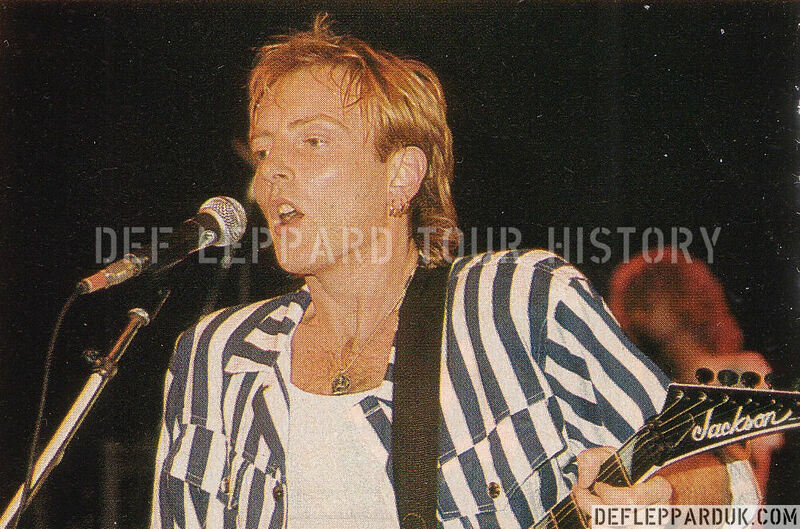 'Love And Affection' was also played having made its debut on the August 1986 warm-up tour. Future 'Animal' B-Side 'Tear It Down' was also played for the first time as part of the encores. 'Love And Affection', 'Billy's Got A Gun' and 'Rock Of Ages' from the second night were recorded and used as B-Sides for the 1987/1989 singles. A remixed recording of Alice Cooper's 'Elected' was eventually released as a B-Side with the Adrenalize singles and on a promo CD issued around the 1992 US Election campaign. 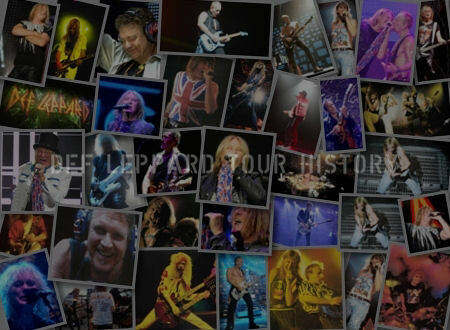 Joe gave Rick Allen a special introduction by bringing him to the front of the stage which was captured in the photos shown below. Read some excerpts from various concert reviews published at the time. 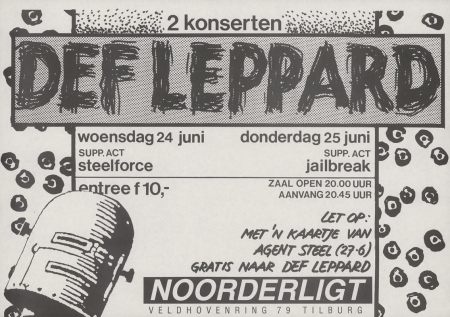 'Animal', 'Armageddon It', 'Pour Some Sugar On Me', 'Don't Give Me Love & Affection' and 'Hysteria' all get premiered before the lackadaisical Nooderligt crowd. The ones at the back in the Slayer T-shirts are waiting to be impressed, but down the front is where they are mostly, nodding their heads thoughtfully, smatterings of split applause greeting the end of each number. 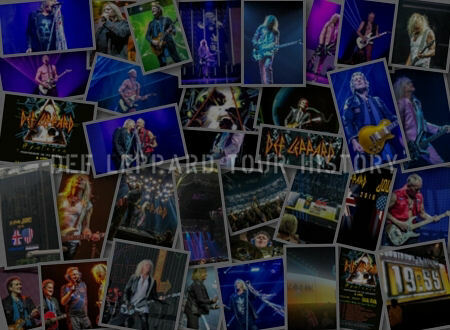 Even more familiar Leppard material like 'Rock Rock' and 'Too Late For Love' draws only politely appreciative applause. "It's fair enough, really," said guitarist Phil Collen after the show, "our music simply isn't that well known enough in Holland for us to expect anything else. I mean, you've got to start somewhere, haven't you?". But when Joe Elliott calls Rick Allen down from behind his kit and says through the mike, "I'd like to introduce you to my mate Rick!" the crowd finally throw their heads back and cheer. It was the biggest noise they made all night, applauding the talents of this gifted young percussionist whose courage has brought him right back from the brink of of tragedy to where he belongs, propping up the beat behind the guitars in Def Leppard. It was a touching moment, and for making it so I can forgive the crowd their reserved reaction to the rest of the set. "Leppard fans who were a bit sceptical about the drumming of one-armed Rick Allen can go back to sleep quietly. He's a 100% full member of the band. 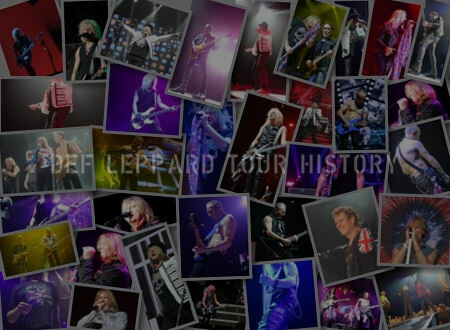 His specially designed drum kit, on which Rick controls his snare and tom sound through pedals he's kicking with his left foot, enables him to make every Leppard song sound as it used to do." "Let It Go" finished the set of the band to a very enthusiastic audience. So to satisfy the audience, the band had to come back several times for encores. 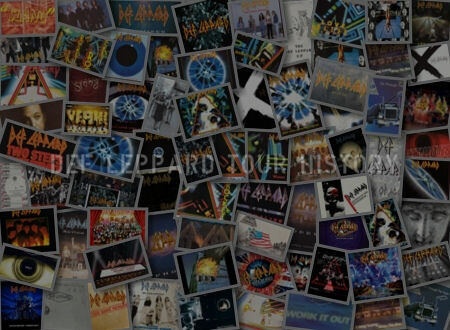 One encore was "Rock of Ages", the song which the band had moulded into a medley of old rock classics which included parts, for example, from Golden Earring's "Radar Love", Led Zeppelin's "Whole Lotta Love", and the Who's "My Generation". 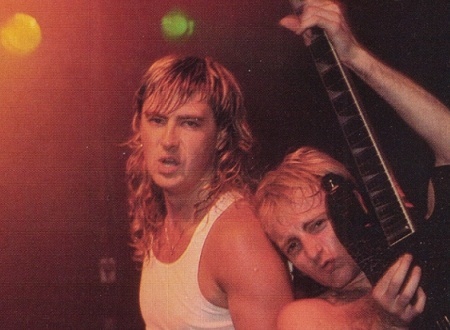 After "Photograph" and the heavy classic song "Wasted" off their first album 'On Through the Night', the band finished their first round of encores with another new track called "Tear It Down". (Read the full reviews on the show page).